It is important to remember that there is a dramatic variation in price between countries when planning a trip. Bolivia, Equador and Peru are traditionally seen as the cheaper countries to travel, each extensively traveled by a large numbers of budget travelers. Chile, Brazil and Argentina are relatively more expensive, almost reaching European prices. Colombia is sort of mid-range between the two groups and the cost of travel in Venezuela is so low it is in a budget travel category of its own. Be aware that crime is a very realistic consideration when traveling here and purchasing and organizing anything is difficult in this torn apart country. -Traveling on a very tight budget we spent $3881 in 275 days (over 8 months) so an average budget of $14.11 each per day.We camped a lot, hiked many of the most popular trails on the continent independent and did a lot of hitchhiking. This was in 2016, so even when adjusting at a very steep inflation rate it is still possible to do this for less than $20 per day. Backpacking budget is not only dependent on price! -The cost of travel on a shoestring budget in each country is not only dependent on price. Some examples; Chile is an expensive, but safe country that is very camping and hitchhike friendly and it is possible to hike independent. In contrast Bolivia is a cheap country, but crime can be a problem and activities are expensive. Consequently we spent more per day in Bolivia than Chile. Traveling solo or figuring everything out for yourself is not everybody’s idea of fun, there are organised overland tours exploring South America, where all you have to do is enjoy the ride. Check out some of world renowned company, G-adventures’ programs. 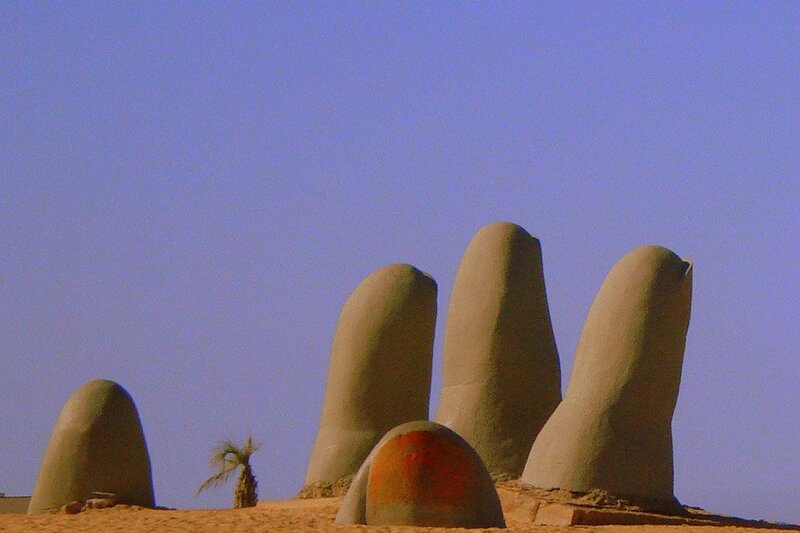 Lima to Buenos Aires – an epic adventure: beginning in Lima and ending in Buenos Aires, 35-full days. You’ll hike the Inca Trail, cross the Salt Flats of Bolivia by 4×4, and feel like a sophisticate sipping wine in Argentina. Along the way, you’ll engage with local cultures with a small group of other young travellers to back you up. -A Comfortable backpacker’s budget when sleeping in a hostel dormitory bed, cooking for yourself or eating in cheap local restaurants, being selective on activities and traveling with public transport should be around $35 per day, so $1000 per month. -Giving an estimate for holiday travel is not really possible; double the backpacking figure for a comfortable, budget holiday trip, double again for traveling in more luxury. I try to give some prices for individual countries. It is strongly advised to do book popular activities ahead, specially if you have limited time or travel on an itinerary. Check here for a variety of tours. The Big Mac Index compares the economy of different currencies by comparing the cost of a Big Mac in different countries. 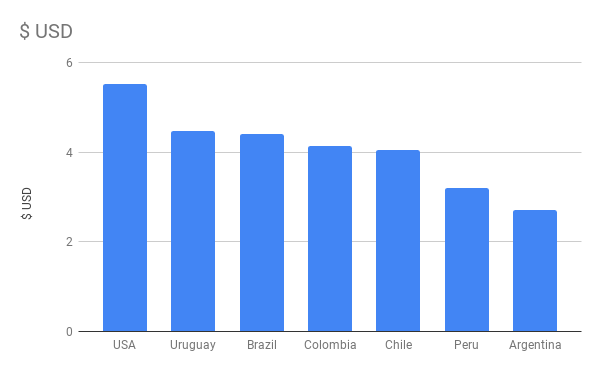 You can see according to the Big Mac Index Uruguay is the most expensive country with a Big Mac costing slightly less than it does in the US, Argentina is the cheapest country. The price of a Big Mac in various South American countries. Reaching South America is now easier than ever before with many flights to a multitude of destinations all over the world’s most exiting continent. Both the east and west coast can also be explored by cruise ship, for a variety of exiting itineraries check out Jetline Cruises. 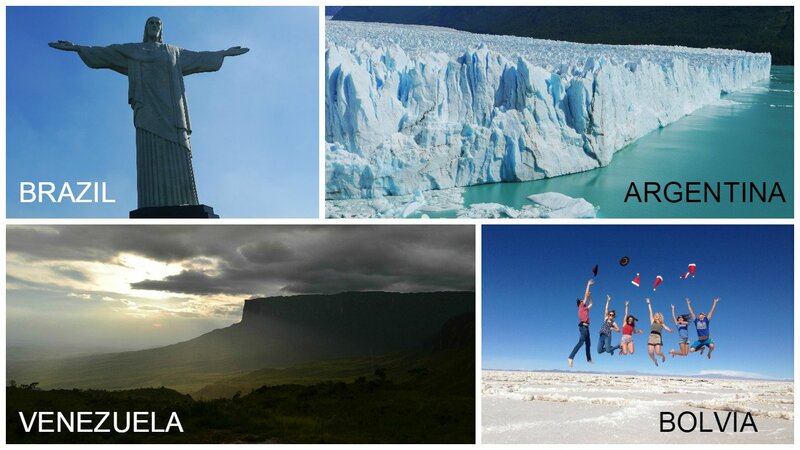 Want to see what places we think are the absolute highlights of South America? Lonely Planet South America on a shoestring (Travel Guide) – Awesome starting point for planning a trip to multiple countries. For Inspriration: Salt & Silver: Travel, Surf, Cook -this book blends traveling, surfing, and the food cultures of Central and South America together through the travel stories of two young, adventuresome guys. At the time of updating this post (November 2018) Argentina is a cheap to travel again! With the exchange rate going from ARS 17 to 37 for one USD in less than a year goods and services priced for locals dropped in price by about 50%. I am not going to go into the yo-yo state of Argentina’s economy, but in our visits here went from cheap too expensive to cheap again. Until December 2015 the Argentinian Peso had a fixed exchange rate. Similar to Venezuela this created a huge US dollar black market where you could buy 50-100% more pesos per dollar. This stopped when Argentina got rid of the official exchange rate as far as we are aware. Argentina, like Chile, is safe, with top quality products and services, the closest you will find to European in South America. You can find bargains now on all local produce, meals in local restaurants, drinks in local bars, Argentinian wine and beer, even Argentinian beef is cheap and expect to pay less for museum admissions, taxi and bus rides and local guides and excursions. Mendoza and Bariloche are regarded as the most expensive places to travel in Argentina and hostel prices here was definitely higher than in Buenos Aires. Mendoza is renowned for its wines, but tasting Malbecs at different estates is definitely not a budget activity, expect to pay $150-200 for an organised tasting tour of the 3 major wine areas; Maipú, Luján de Cuyo, and Uco Valley. Doing it independent you can do it for about half, but will definitely see and taste less. Flights and hotels are priced in dollars, so here you are not going to find massive bargains. We spent ARS 4238 ($ 212) in 17 days, thus ARS 297 ($ 13.97) each per day including all food, transport and other expenses. During our last visit to Argentina the peso was much stronger, we still managed to backpack it on a very frugal budget by hitchhiking, camping and couchsurfing, like Chile it is a safe country allowing to travel in such a manner. Food is definitely one of the highlights in Argentina. They have a reputation for good steak, wine and mate and this is well deserved. Steak in a restaurant and on the barbecue was first class. A nice Bife de Chorizo (sirloin steak) is about ARS 500 ($13) in a restaurant in Buenos Aires. Argentinians are addicted to Dulce de leche (caramel/boiled condensed milk), big containers are cheap. We ate lots of dulce de leche on Maria biscuits during hikes. Ice cream and alfajores sweets is something not to be missed! The top of the range sweets Cachafas Afajores and Freddo ice cream is worth buying once to taste. Falling back on Grido ice cream and Guymallen alfajores for a fraction of the price is a good budget strategy. Despite the favourable currency for traveling the bus prices that I find online is still high. A bus from Santiago to Bariloche is about $70 for a 24 hour bus ride, not that much cheaper than what we experienced a couple of years agol The buses are very comfortable and by taking a night bus you can save on accommodation. We broke our hitchhiking records in Argentina by traveling almost 4000 km in 2 rides from Punta Arenas in Chile all the way to Buenos Aires. This trip would have cost us $180 by bus. I will not recommend hitchhiking around the cities it took us 2 days to get out of Buenos Aires! In Buenos Aires a dormitory bed in a hostel costs $6-10. A budget double room starts at $25. Camping at El Chalten costs about $5 per day, a dormitory bed in a hostel here starts at $10. There were not visa fee for Russians or South Africans. Australian, US and Canadian passport holders do not require a visa, there used to be a reciprocal fee to enter Argentina, I understand that was recently cancelled. 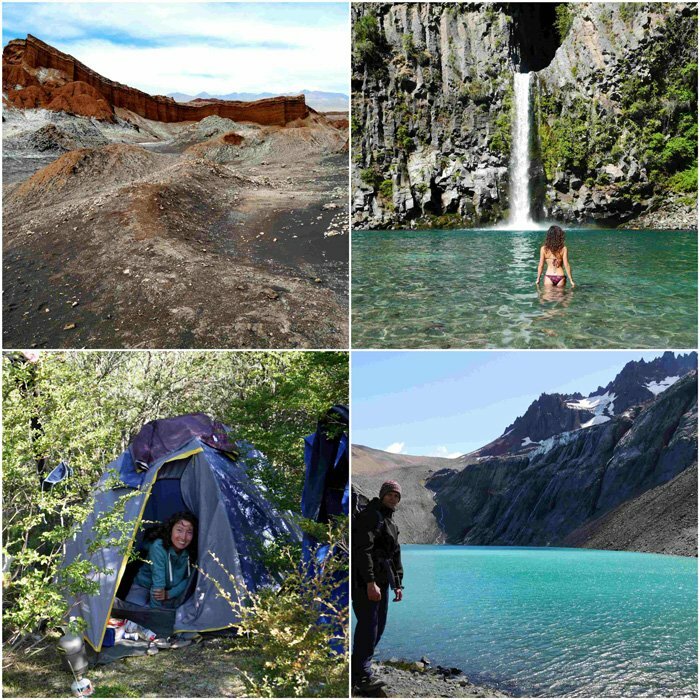 Hike and Camp at El Chalten, the route and camping on route is free. Explore Chile & Argentina from the tranquil wineries of the Maipo Valley and the lush landscapes of northern Patagonia to the steamy tango joints of Buenos Aires. Hike Chile’s stunning Lake District, take one of the world’s most scenic ferry cruises and sample the region’s outstanding wines. Bolivia is another South American country with a lot to offer adventurous tourists. It is known as the cheapest country in South America and is thus great to travel if you are on a budget. If you love to get your adrenaline pumping there are some unique opportunities in Bolivia, one of the easiest 6000m peaks to climb, cycle the most dangerous road in the world and do some spectacular hikes. Food and accommodation were cheap in Bolivia, but activities and tours were expensive like in all other countries. We were discouraged from hiking and camping on our own, due to muggings and robberies. So traveling on a shoestring budget Bolivia ended up costing us more than many other countries on the continent. If you however travel by bus and stay in hostels during your travels Bolivia will probably be your cheapest country. Bolivia -The Uyuni Salt desert was one of the highlights of South America! We spent BOB 2020 ($ 294) in 15 days, thus BOB 135 ($ 19) each per day including all food, transport and other expenses, but if you only subtract the cost of the 3 day Uyuni tour, Bolivia cost us less than $14 per day. Similar to Peru a set menu “menu del dia” at local restaurants is good value for money at around 20 BOB ($3). It is normally a main course, a drink and sometimes a small desert. We often bought food at the market and cooked for ourselves, vegetables some interesting and delicious fruit was very cheap here. You can usually find a meal at the market anytime of the day, we enjoyed the breakfasts. Don’t drink the tap water in Bolivia. 45 ($6.50) for a seat on a local bus. These activities are pricey, but why come if you are not going to experience these things? 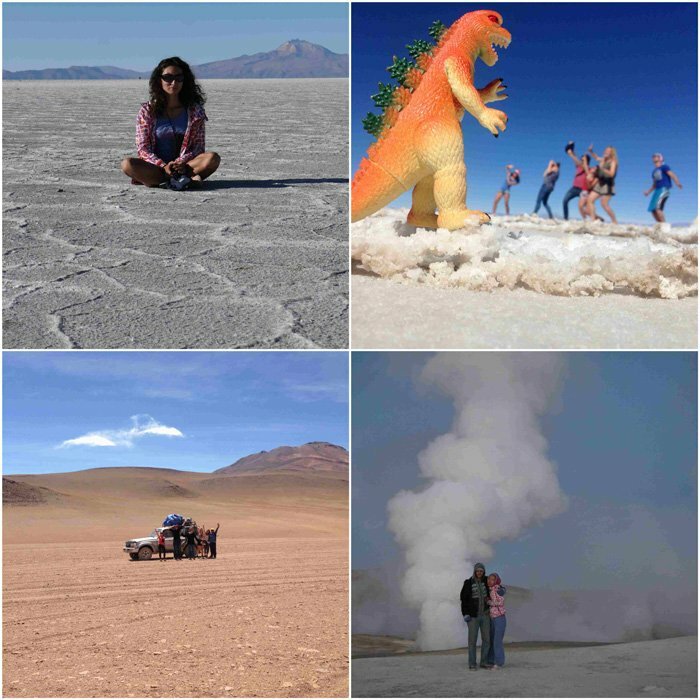 Our Uyuni saltflats on a backpacker budget guide. In La Paz take a collectivo BOB 6 ($1) and go and walk around the beautiful Valle de la Luna (Moon Valley) entrance is BOB 20 ($3). Go to the interesting witches market in La Paz, it is free. In Sucre walk to “7 Cascadas” (7 Waterfalls) outside the city. Bolivia Discovery – 11 Days La Paz to La Paz. From La Paz, the highest capital city in the world, travel to the crest of the Andes and the middle of nowhere for three days of incredible off-road exploration of the Uyuni Salt Flats and surrounding desert altiplano. Take the road less travelled and meet locals for an immersive cultural experience that few travellers get to know. US and South African passport holders do require a visa. You can apply at a neighbouring country (e.g. Peru) SA passport holders it is free, US citizens $160. Brazil is a fantastic country to travel with some of the most extraordinary places to visit in South America, don’t miss the wild Amazon, the amazing wild life of the Pantanal or the unreal vibe and beaches of Rio de Janeiro. Brazil is not cheap, despite many poor people staying in favelas; food, accommodation and tourist activities are some of the most expensive in South America. Inequality here is massive, similar to my home country South Africa, I could not help to constantly compare Rio to Cape Town. 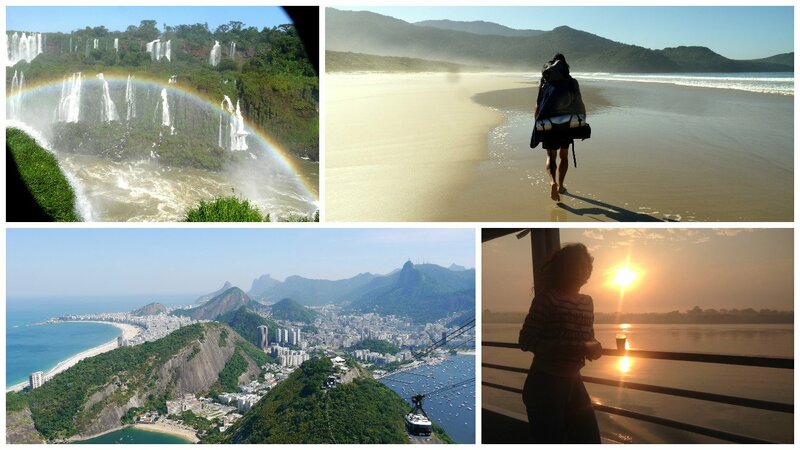 Amazing Brazil, Iguazu Falls, hiking around Ilha Grande, Rio De Janeiro and two weeks on cargo ships on the Amazon. Be inspired by the new edition of Insight Guide Brazil, a comprehensive full-color guide to one of the most exciting countries in the world. We spent BRL 2429 ($754) in 44 days, thus BRL 55 ($ 17) each per day including all food, transport and other expenses. Don’t look at our budget and think it is an cheap country, Brazil is very expensive. Our avg budget for Brazil was good because we spent 12 days on a slow boat/cargo ship on the Amazon during which we could not spend money. We hiked around Ilha Grande island for five days, that was amazing and very cheap. We camped when possible. Long-distance buses are a convenient, but they are pricey a bus ride from Rio de Janeiro to Foz do Iguazu (19 hours) starting at BRL 270 ($70). Buy your ticket at least one day in advance. Local public transportation costs 2-5 BRL per ride. Uber works well in 11 Brazilian cities. We did hitchhike sometimes, but getting rides in Brazil were not always easy and we sometimes ended up taking the bus. Cruise down the Amazon on a slowboat. Do a free walking tour in Rio de Janeiro. Hike around Ilha Grande with a tent, we only had a week, but you can easily spend 3 weeks walking around this paradise. UK, South African and New Zealand passport holders do not require a visa for entry into Brazil. $160 USD, Canadians $65 USD, and Australians $35 USD. need visas. Ilha Grande, hiking around an island. Wonders of Brazil – From the cobblestoned streets of colonial Paraty to remote interior wilderness, uncover the wonders of Brazil in two exciting weeks. 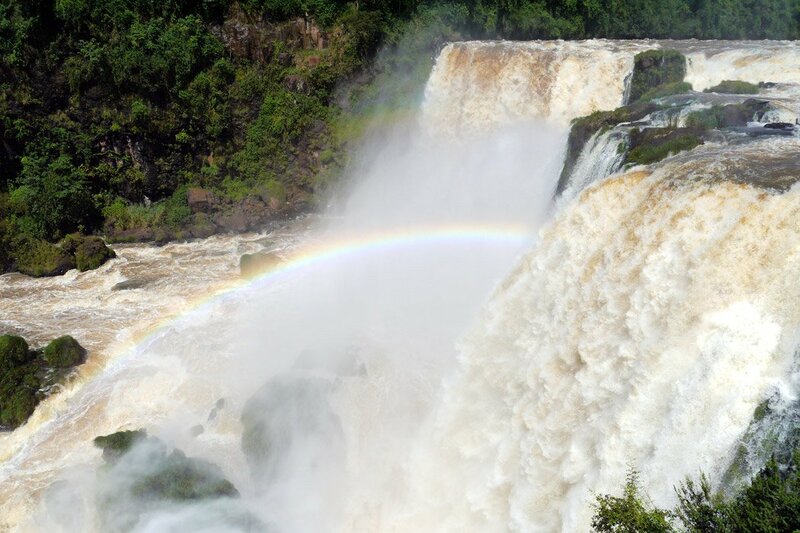 Experience Iguassu Falls — a series of falls so massive it straddles two countries and so intriguing you’ll need two days to fully appreciate the view. Not to be outdone, the Pantanal wetlands are teeming with wildlife like caiman, jaguar, and exotic birds. Finally, trade early morning songbirds for some samba in Rio and the rhythm of the beach. This adventure provides natural and cultural highlights and the best Brazil has to offer. Chile was our favorite country traveling in South America, we spent 3 months exploring from the Atacama desert in the north to the south of Patagonia. 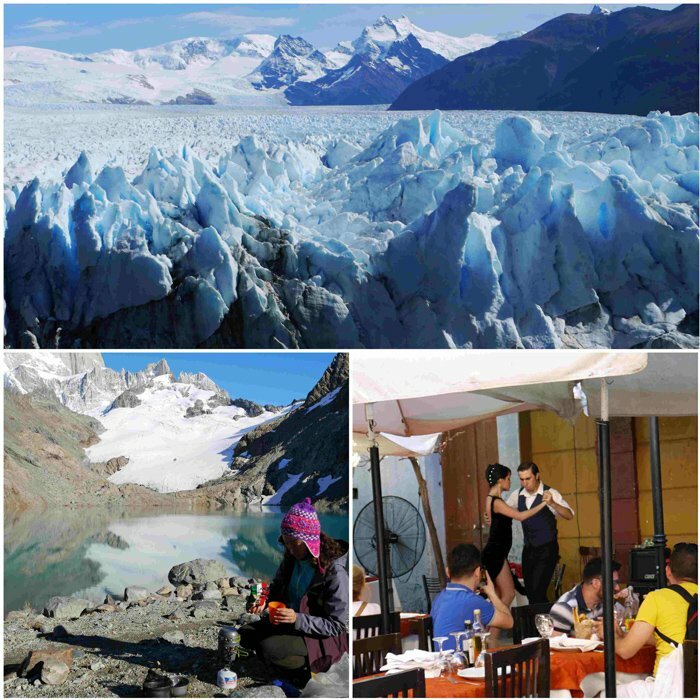 The landscapes are jaw dropping, from the driest desert in the world to the amazing mountains and glaciers of Patagonia. We did quite a few amazing hikes in Patagonia and if trekking is your thing, add this place to your bucket list. Torres Del Paine is the most famous hike around here for a good reason, many people walk it but it is truly spectacular. Food, accommodation and transport all make Chile more expensive than some of its neighbours. Lonely Planet’s Chile & Easter Island guidebook published October 2018, up-to-date advice on what to see and skip, and what hidden discoveries await you. Chile – picking so few photos of over 2 months that we spent in this amazing country is harder than traveling here on a $13 per day budget! It is an expensive country, but an amazing place to backpack on a budget. How could we travel here with so little money? Camping, hitchhiking and couchsurfing. Chilean people are unreal, we have many stories about their fantastic hospitality. We never used public transport in Chile hitchhiking thousands of kilometers, it was safe and easy and we met some amazing people. We did many multi-day hikes here and because we did it on our own it was very cheap. Transport is a major expense when traveling here, the buses are quite expensive, especially when you get to Patagonia. The Carraterra Austral is mostly gravel road so the trip from Puerto Montt to Puerto Natales takes 34 hours by bus, costing $80. Flying is sometimes a better option than the bus, if you go to Puerto Natales to hike Torres del Paine it is a lot faster. Hitchhiking worked fantastic for us in Chile all the way from the most Northern to Southern towns, San Pedro de Atacama to Villa O’Higgins. Citizens of US, UK, Canada and Australia and South Africa do not need visa, 108 other countries do so check before going. Australians have to pay a $117. This is the country to travel with a tent, there are campsites everywhere. When there were none we did some ‘bush camping’ and even pitched our tent at a fuel station. We made great friends couchsurfing and off course saved a lot on accommodation in the cities this way. If you look at hostel prices you can see that if you do not camp accommodation in Patagonia will cost you a pretty penny. G-Adventures adventure tour – Imagine almost three weeks packed with every activity you can think of and then some! Trek through perfectly picturesque Patagonia, wake up early for whitewater rafting, hike through crisp mountain landscapes on Torres del Paine’s renowned W Trek, and bike, raft, and smile to your heart’s content. Your adrenaline reserves will be tapped by the end of it all. We loved Colombia, nice people, the people are very friendly, the food is amazing, there are some awesome activities to get your adrenaline pumping and the best is that it is very affordable. What an adventure we had traveling in Colombia; I am a coffee junkie and following a coffee the world’s best coffee from bean to cup in the mountains was amazing. Beautiful country to explore a variety of interesting places from colonial cities, great beaches and the Amazon to a beautiful desert. We spent 1 851 135 COP ($636) in 31 days, thus 59 714 COP ($20.50) each per day including white water rafting, paragliding and a plane ticket from Bogota to Leticia. We spent very little on food by buying groceries in the supermarket and cooking in the hostel. You can see exactly how we regulated our budget in our Colombia Budget Backpacker’s Guide. The budget airline Vivacolombia is a cheap way to move long distances. Uber is available in cities and is cheaper than taxis. 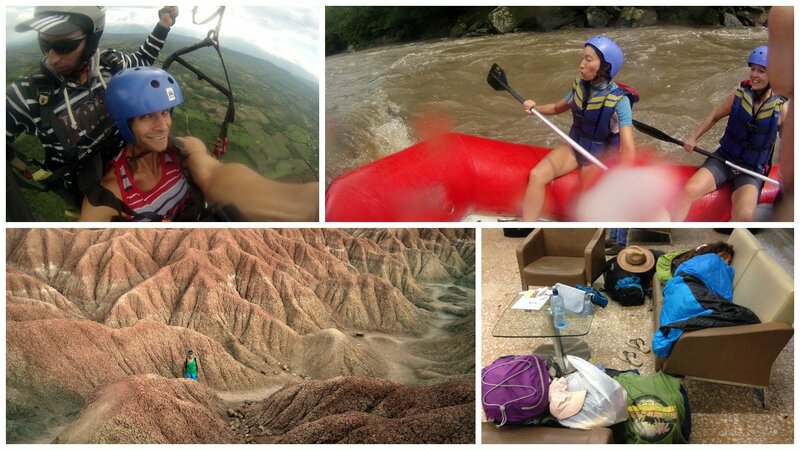 Adventure activities was well priced in Colombia, it was the only country we decided to splurge. 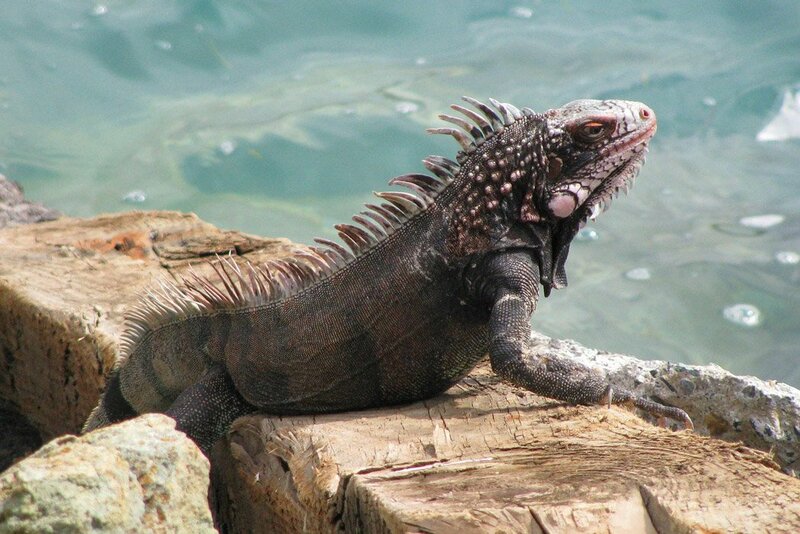 Scuba diving – there are some cool spots from Cartagena with nice wrecks and marine life. Don’t miss a tour of a coffee plantation starting at about 15,000 COP ($5) – Don Elias in Salento is fantastic. Transport was expensive. We saved a lot on accommodation by taking night buses for longer distances, thus saving on a night’s accommodation. We did not hitchhike in Colombia (no reason). Cook for yourself, food in supermarkets was good and very cheap. Visit museums on Sundays, many are free. Get a ‘Hola Hostel’ card, they are free, good discounts. Free walking tour in Medellin – excellent! Hiking around San Gill – well marked 3 day trail to do on your own. Walk around in The Tatacoa Desert. Coffee tasting in Salento, cheap not free, but a must for a coffee lover. G-Adventures Colombia 9 Day Bogota to Cartagena – Where to go if you only have a week to experience a truly unique part of the world? The answer: Colombia. If you think a week isn’t enough to tour the beaches, coffee regions, and metropolitan cities of this reemerging country, think again — we’ve made it possible. Check out the resurgence of culture, art, and food in Bogotá and Medellín, dive deep into the Caribbean vibe in Cartagena, and enjoy the Latin-Caribbean fusion of flavours in local cuisine. All this in only nine days. Start packing now. Located between Colombia and Peru, Ecuador straddles the equator on the Pacific side of South America, Ecuador is a small, but diverse country most famous for the Galapagos Islands, which sparked the genius idea of evolution in Charles Darwin. It is perhaps the cheapest place from which the Amazon jungle can be explored. In Quito you can straddle the equator or go shopping for authentic souvenirs in the Otavalo market 3 hours away. Up for adventure? Climb the 5897m Cotopaxi volcano or ride down from 4500m on a mountain bike! The great thing about Ecuador for backpackers is that it is fairly cheap to travel here with lots of well-priced accommodation and adventure activities. You can eat at a local restaurant for $3-5 and in the markets for less than $2. European meal (hamburger/pizza) around 10-12 USD. Long distance buses are a good deal for less than $2 per hour travelled. United States, Canada and most European countries can travel to Ecuador visa free for up to 90 days. Unfortunately going to the Galapagos islands is a very pricey exercise even which will cost at least $1000 even for the most stingy nomads. Flights, conservation fees and ferries alone is round $500. If you shop around you can do a 3 day local Amazon tour for about $120. With a higher budget you can do a 5-day tour and explore the Ecuador Amazon and live locally, admire rainforest wildlife, learn about shamanic practice and do several outdoor activities – isn’t it an amazing way of getting to know another country?! Go to the Otavalo market. G-Adventure galagapos – This adventure is perfect for those who want to experience the incredible wildlife and scenery of the Galapagos Islands but prefer to sleep on shore so your time on the water is limited to commuting between islands. Go ashore at the lesser-visited island of Isabela and spend your days with playful sea lions, giant manta rays, and the Galapagos giant tortoise. This adventure offers a great balance of guided excursions and free time and optional activities abound. We spent PYG 191 000 ($ 34) in 3 days, thus 63 666 PYG ($12) each per day including all food, transport and other expenses. Extensive bus network connecting towns and cities, don’t expect luxury buses. Taxis are well priced, motorbike taxis are cheap. Peru is still one of the cheaper countries to visit in South America hosting some of the continent’s most famous attractions. The two most popular highlights are without a doubt the Inca ruins of Machu Picchu and the multi day hiking trail ‘The Inca trail’ leading up to this archaeological wonder. Peru has so much more to offer, visit the fascinating man made islands of Lake Titicaca, explore the Amazon from Iquitos, check out Lima or go surfing at Mancora. Peru is a dream destination for trekking with a staggering array of trails winding through the Andes. 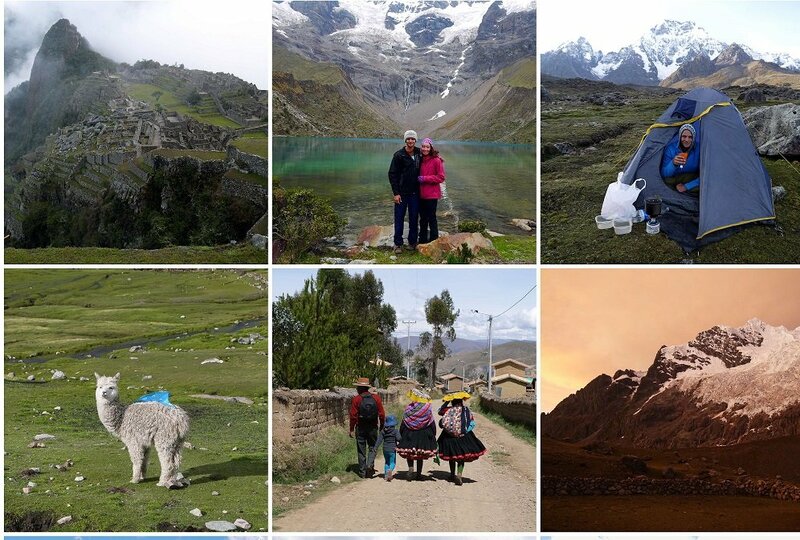 These spectacular mountains offer a lot more than just the Inca trail; we spent a month in Cusco alone, doing some fantastic trekking like Salkantay, Choquequirao and Ausangate. If you do these treks independent it is dirt cheap, what an awe-inspiring experience! We spent PEN 2008 ($592) in 37 days, thus Sol 54.20 ($ 15.95) each per day including all food, transport and other expenses. Trekking in Peru was very cheap, we had an amazing time and saw some unreal places! For us doing a lot of hikes made Peru cheaper not more expensive. Doing independent hikes costs were minimum. During hikes accommodation was free and food was very cheap. Are you a foodie? Go to ‘Central’ restaurant in Lima, the nr 1 restaurant in South America and nr 4 in the world, a bit above our budget at round $200 for a 17 course meal, but we heard about the magic chef Martinez serves here, culinary art taking you from 20m below sea level to 4000m above. Some hostels include breakfast, usually simple (yes read not enough). We drank a lot of tea in the mountains of Peru. Most hostels give unlimited free coco tea since it helps with altitude sickness. Bus travel in Peru is well priced with different options and prices. A bus ride from Lima to Cusco in a nice bus with wifi starts at about PEN80 ($25) for the 22 hour ride. Shorter trips of around 2 and a half hours were about PEN 10 ($3). Machu Picchu entrance is $47 including Machu Picchu Mountain. Machu Picchu is amazing despite the 4000 tourists a day, a must see. I recommend skipping the Inca Trail, hike a different route. There are many amazing hikes around Cuzco and several options to hike to Machu Picchu. The Inca Trail is the most famous and most touristy, this does not make it the best. See our Salkantay to Machu Picchu, an alternative route article for more on the topic. Peru is an amazing culture and adventure experience; activities will be your biggest expense, go for it! It will be an experience you will treasure forever. carry your own bag and use a map instead of a guide, there are some of the world’s best hikes in the Peruvian Andes! Take a slowboat trip in the amazon from Iquitos to Leticia. Awesome activity when traveling South America on the cheap. G-Adventures Peru – Find adventure at every turn on this 14-day trip through Peru. Catch the scenic train to Machu Picchu, or challenge yourself by hiking the famous Inca Trail. Peer up into the canopy of the Amazon rainforest to search for jungle wildlife. From sacred ruins to otherworldly mountain vistas and cloud forests, set your sights on this celestial place. Uruguay is known as an expensive country with top quality beef and people living on Mate, sort of a super Argentina, this is not too far off. The most popular places to visit in the country are Montevideo, Punta del Este, Colonia, Punta del diablo, and Cabo Polonio Rocha. The country is predominantly a summer beach destination, which is great since going to the beach is free. Kitesurfing is a popular activity and don’t miss eating a local steak and drink some matet (the mate straw is a cool gift to take home). Most travelers arrive in Uruguay by ferry straight from Buenos Aires ($56). The ferry is expensive and we decided to hitchhike the long way around, it took a long time. The country’s small size and efficient bus system allows for easy exploring of the whole country. We spent UYU 3954 ($ 140) in 7 days, thus 564 UYU ($20.50) each per day total, we did some hitchhiking and camping. Eating in restaurants is very expensive, but like Argentina eating a steak is one of the must do things in Uruguay. Chivito (Uruguay’s classic steak sandwich) goes for about US$10, eating in a midrange restaurant $25 with a drink and double that for eating in a top end restaurant with wine. Lunch in a local restaurant cost about UYU 350 ($12). A Mcdonald’s meal is about UYU 280 ($10). Shopping and cooking the prices are not that crazy and staying in a hostel with cooking facilities is the cheapest way to travel here. All the cities and towns in Uruguay are connected by an extensive network of bus routes. The distances are short and we were surprised that transport is relatively cheap. The inter-city buses are modern, clean and comfortable and it was awesome that these buses have quite good Wi-Fi. Long-distance bus rides are about US$7 per 100km travelled. Traveling to the beautiful, dangerous and destroyed country of Venezuela is strongly discouraged by every foreign office around the world. 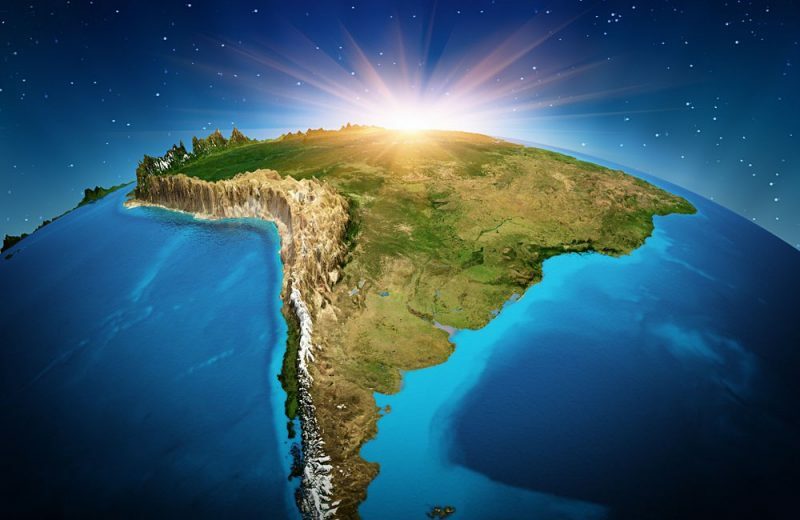 Once one of the richest nations in South America, with massive oil reserves, due to political corruption and civil unrest it became a country with massive social and economic problems. We had a great time traveling here late 2015, the country was already in distress and empty shops, corrupt police and non-existent service made it hard to travel here. It was however very cheap, we were traveling on cents, if it is ethical to travel to Venezuela is another hot potato. Because of the exchange rate in Venezuela, tourists with US dollars have a lot of money. These are 50B notes (almost $10 notes). Most things, don’t get robbed. Travel Venezuela, a backpacking guide. Guyana, Suriname and French Guiana collectively called the Guianas are three territories located on the North Eastern coast of South America . Getting to the Guianas is not easy and the countries are expenses, they are skipped by most travellers in South America for these reasons. We briefly set foot in Guyana hiking in Venezuela, but since it is European territories we did not want to go through visa processes to travel here. Since we did not travel through the Guyanas I am including this based on what I heard and found online. – French Guiana is a part of France, and thus of the EU, here you enter the EU while still standing in South America. There are not many touristy sites in the country. French Guiana is a very expensive country, even as a budget traveller you will find it hard to get away by spending less than $80 per day. Since there is no backpacker facilities expect to pay over $50 per night for accommodation. – Suriname was formerly known as Dutch Guiana, the smallest country in South America only has a population of 550 000, Dutch is the official language and people drive on the left hand side. Over 90% of Suriname is covered in primeval rainforest and there are some awesome fauna and flora to experience here, river dolphins, 1000 pound leather back turtles laying their eggs on the beach and the gold footed tamarind monkeys. Suriname sounds like the cheapest of the three, you should be able to find accommodation for under $25 and get away with a budget of round $60 per day. – Guyana located between Venezuela and Brazil, bordered by the Atlantic Ocean in the north is South America’s only English speaking country. This year (2018) Guyana was a popular destination under travel bloggers. Traveling independent I heard Guyana is a very difficult country to get around in. Visitors go to see the incredible nature, with sites like the tallest free falling waterfall in the world (Kaieteur Falls). There is an incredible diversity of animals in the Amazon jungle and savannahs in Guyana, you can see the massive freshwater fish, Arapima, giant anteaters, piranhas, tarantulas and even jaguars if you are a birder the more than 900 species of exotic birds makes this a bucket list spot. You should be able to find accommodation in a guesthouse for about $40 per night. and get away with a budget of round $70 per day. Handy stuff to pack for a Monster Trip! 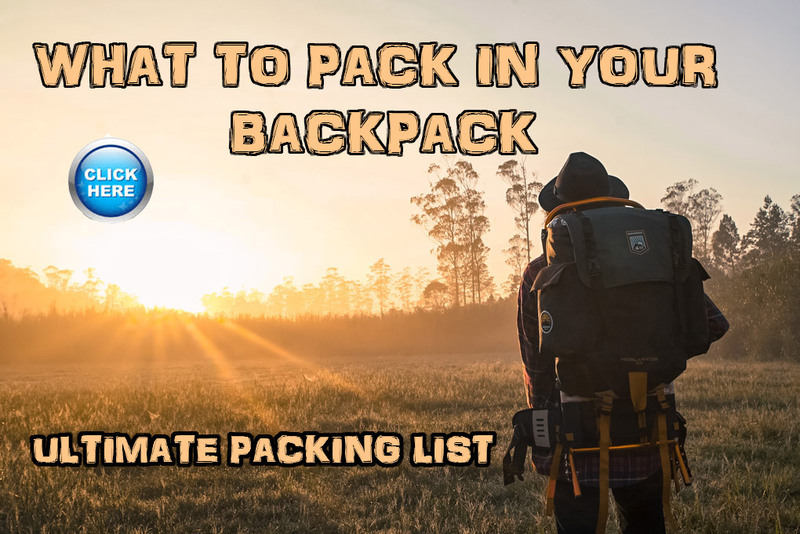 Good travel and hiking Backpack – you want something that is easy and comfortable to carry, that is a good hiking pack if you are going to Patagonia, but that is easy to open like a good travel pack. This is hard to find, a great hiking backpack that is not just top loading. 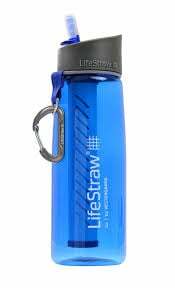 Water is not alway drinkable and bottled water can be expensive, we save a lot of money with our life straw in a bottle This amazing device is super handy if you are going hiking independent. We’re currently planning our trip and were getting freaked out by what prices we were estimating but will be using your tips to help us get more for our money! I’ve read that most countries want proof of onward travel which made me think we needed to fully plan our whole South American trip in advance. From reading your blog I’m assuming this wasn’t an issue? Did you get challenged about this at any point in your trips? Hello Kelly-anne, thanks for reading! We were never asked for proof of onward travel in South America, we have only been asked once in more than 6 years of travel while crossing a border overland and that was going from Nicaragua to Costa Rica. This is sometimes asked when flying between countries before departure (from Panama to Colombia many people where sitting in the airport organizing proof), so if you fly between countries in South America it might be an issue. There are several options for creating proof of onward travel; you can reserve a flight for free with Yatra, you can make a fake ticket with Return Flights or you can book a verifiable ticket for a small fee using bookingforvisa. Safe Travels! I really enjoyed reading your article- it’s exactly what I’ve been hunting for. I am planning a trip to Latin America in April for at least 6 months, but I’ve been told this isn’t the best time to travel as far as weather is concerned. What do you think? What vaccination certificates should I get before I travel to South America? (I am European) Is it only yellow fever vaccination certificate? P.S. You inspired me so much! Because of your blog I’ve got courage to travel there for few months! Hello, Anna! Thank you for your comment! As far as we know yellow fever certificate is the one you need for South America, we both have it in fact nobody has ever asked us to show it. Some countries have it as a requirement if you’re planning to go to the jungle area e.g. Amazon or Pantanal. It’s better to have it just in case, it’s valid for 10 years. Good luck with your trip! I’m sure you’ll enjoy it, South America is an amazing continent! Hello, was the budget $3881 each? or for the both of you? Thanks – very useful post! Hello Mollie, thanks for reading! Yes that was our budget per person. Fantastic post, it has really helped me get an idea of a budget for our 4 month trip in April 🙂 so excited now ! We’re glad you found our post helpful! 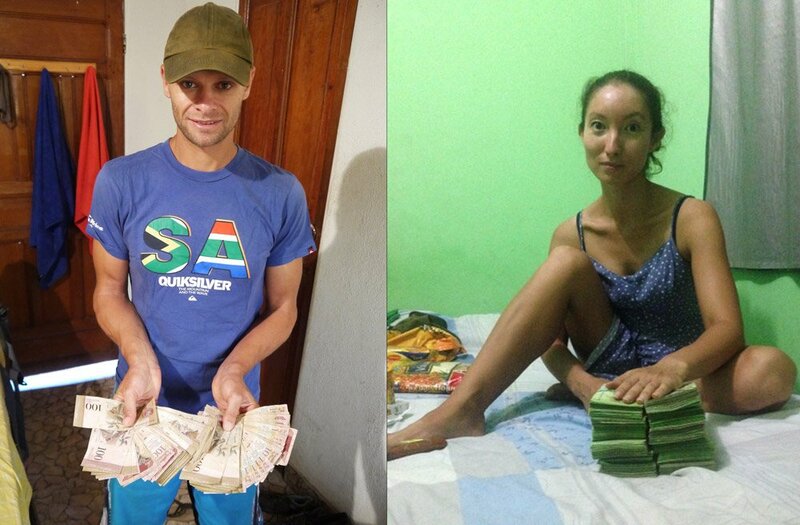 Campbell and Alya, thank you for being soooo helpful in assisting backpackers on a budget through this post of yours. I am so glad to be landing on your website. I am backpacking Latin America(Starting with Brazil, Argentina, Chile, Bolivia, Peru, Ecuador, Colombia….Mexico(may be) ) starting this November 20th. My Indian passport makes it kinda difficult to travel to Uruguay. This will be my first travel experience outside India and Nepal. I plan to travel anywhere between 6 months to 12 months depending on the travel vibes and the money of course. On discussing with a couple of other Indian backpackers(there are very few of us out there, yet) and reading different blogs I am planning to travel on a budget of $10-$15 per day in the continent. It seemed very unlikely until I came across your post. I know the drill about surviving on this budget and I think there is so much to gain from your post to help me achieve this. I have plans to hitchhike, couchsurf and camp(I will be carrying one myself straight from Inida) and cook my own meals wherever possible. I will be able to travel on a $450 per month budget for 10 months. If there is something more you would want to advise or suggest me, please do. I have sent you guys an email as well. Hello Rajat thanks for reading and your nice comment, it is always great if our posts are helpful! You are aiming for a tight budget but it is certainly not impossible. It looks like you are planning to use all our big money saving strategies. I think being 2 also saved us a bit since we shared a lot of things. Also hitchhiking and camping it is always great to be 2, so try to travel with a buddy (girl get rides easier). Learn some spanish, it will make your life a lot easier. Nice thing about your plan is that you are going from expensive countries cheaper. We did not receive an email from you, did you use contact us from the website? Really good and clear information. You are a great help to many travelers! I am planning a trip in which I want to camp when possible, but I am definitely a hammock person. I know it varies from country to country, and even within a country (obviously less options in the Andes), but do you think that hammock only camping is possible without too much hassle? Hello, Matthew! Thank you! Only hammock will be ok for Brazil climate wise everywhere, in Colombia, Ecuador, Peru on the beach and in the North of Chile and Argentina. I’m just not sure about safety issue, with a tent you can put all your stuff inside but in campsites or very remote places in should be ok.
wow, this is an amazing post! i’m backpacking in south america for 6 months and this is going to be a big help with planning! Also, I’m doing part of the trip by myself and was wondering how you feel about hiking/camping solo? Or is likely that I would meet other travelers along the way and maybe join their group? About hiking and camping alone it depends on a country, e.g. in Chile it’s safe you can easy hike in all National parks on your own. Camping in campsites is 100% safe we met some guys and girls (even a pregnant one) camping and even hiking alone. For some hikes like Torres del Paine or Salkantay even if you start alone you’ll meet many other travellers doing the same route so can join them in process. In general in all popular hiking destinations there are many tourists if you stay in a hostel I’m sure you’ll be able to find people willing to do a hike with you. If you have more questions we’ll be happy to answer! Hello there, so happy i have stumbled upon your blog! 🙂 This really helps, since we’re planning a 3-4 months trip to South America next year,and were looking for a realistic budget estimation 🙂 Will definitely save your article for future research :)) Cheers! Hi, guys! Thank you for reading! We hope our article will help you to plan your trip! If you have any questions we’ll be happy to help! Hey this was a great read. I’m going to South America for three months and struggling to budget. The most expensive is travelling from country to country. I am only going for three months but travelling to most countries. Hello Danielle, thanks for reading! I agree if you travel such big distances in 3 months transport is going to be a major expense. Hitchhiking saved us a lot of money, but safety is always a concern especially if you are traveling solo. Taking night buses helps, saving on accommodation. Traveling with a tent was probably our biggest money saver. 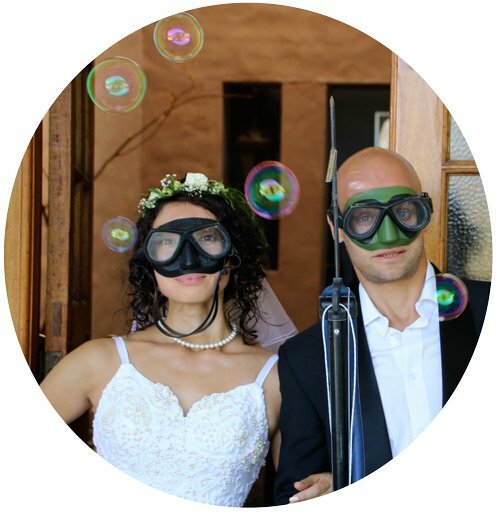 Hi think your website is great we are going to South America in February for 3 months with an budget of $4400 all in for the two of us.Going from Brazil to Peru finishing in Columbia In your opinion is this budget realistic. Hi Kyle, thanks for reading! That is about $24.50 per day each. It depends on how long you are going to spend in which country and what you are planning to do. It is certainly possible. You will have to stay in dormitories/camping sometimes, cook yourself and minimize guided tours. I think Brazil is the most expensive of the three countries. We explain how we kept our budgets low in each country. Please shout if we can help. Enjoy, Safe Travels! Hi! Is this budget based on the cost per day of 1 or 2 people? Thanks! Hello, Dimitria! The budget is per person per day. Thanks for this post! I am travelling there in 2017 and was curious of the price of food and drink will definitely make budgeting easier! Thank you! We’re glad you found it helpful! If you have more questions about South America don’t hesitate asking! Thank you! South Africans do need visa for Bolivia. We got 30-day visa in Puno, Peru at the Bolivian consulate for free, you just need to bring all required documents (booking, itinerary etc.). It took two hours to get it. Apparently you can get it in Bolivian consulate in Cusco and Lima or any other neighbour to Bolivia county. Thank you very much, going to South America for 3 months in January and this was a massive help! Thank you! If you have more questions on traveling South America don’t hesitate to ask, we’ll be glad to help you!